I often her about how peoples expect to find a lot of spices in Turkish cuisine. It could hardly be further away from the truth. I often hear comments like: “It’s not that spicy”, “Is the food very strong?”, “Turkish food – isn’t something with cinnamon, cumin and other weird spices” (no, it’s more in it Moroccan and Middle East cuisine). And to that I can say both yes and no. Turkish food is all about the ingredients – ie fresh ripe vegetables, and then it’s about using time and thorough preparation. Because yes, Turkish food can take oceans of time to make (just try folding Manti for 4 people = a full morning project). Just frying the onion to some dish can take 5-10 minutes if you want it right and take advantage of the caramelized flavor. So yes with good ingredients, time and careful preparation, you will be on the right path. But of course there must also be some spices once in a while. And to help you a little, you get an overview of the most important ones. In this list I do not describe other than the dried spices and pasta. The rest (like special vegetables, beans, nuts, etc.) must come later. Some of them you might be familier with in advance, but there are some, which are a little special. And therefore it might be very nice just to get an introduction, so you know how to use them, if you for example buy Sumac. Salt and pepper: – Yes, maybe it’s very banal, you might think. And yes, it is, but nevertheless, a very important part of all the world’s cuisines. Salt and pepper are both undisputedly the most widely used flavors for meat, vegetables and everything you eat. Tuz ve biber, as it is written in Turkish, is best if it is freezly grinded. But I always use just plain coarse salt (sometimes flakesalt) and freshly ground pepper. By grinding all the peppercorns you get a different flavor than from the terrible powder, that you can buy in buckets. 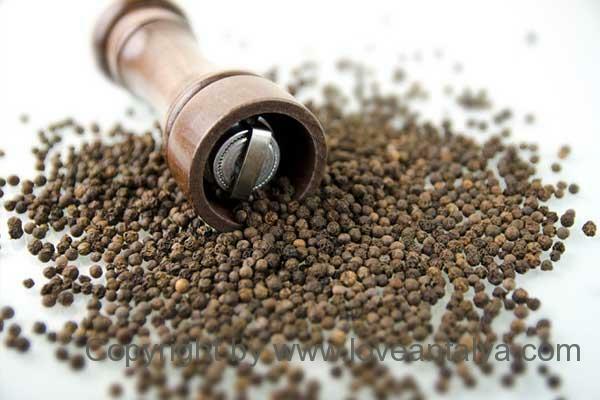 If you do nothing else, do that at least – invest in a good pepper grinder and some black pepper grains. Then you are already far? 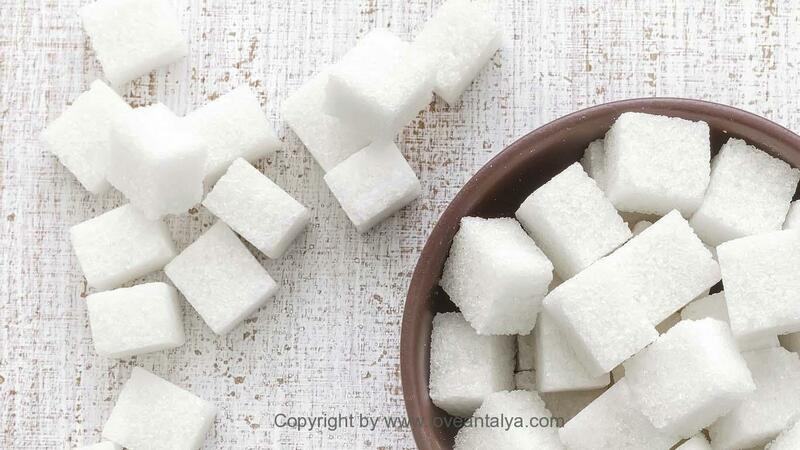 And now we are at the banalities … sugar (“şeker” in Turkish) is another of the most widely used spices in Turkish cuisine. 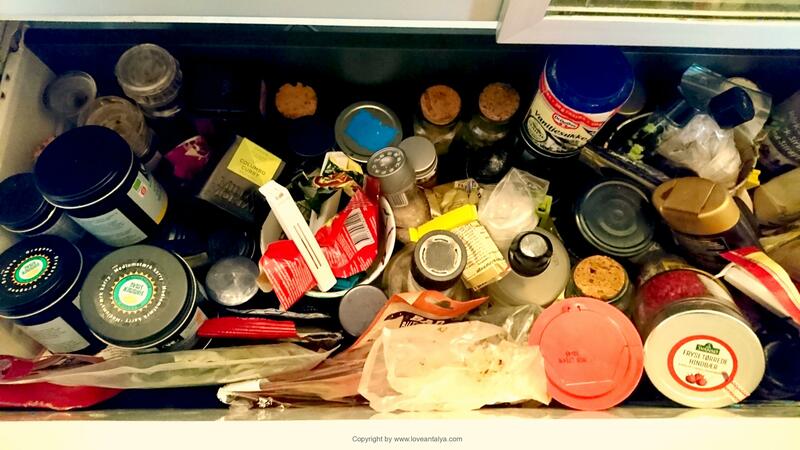 Because yes, sugar is a spice and flavor (for example, did you know that if you add some sugar to your dishes with tomatoes, then the flavor of tomatoes will be present in a completely different way?). And then, the Turks simply love sugar in all shades. 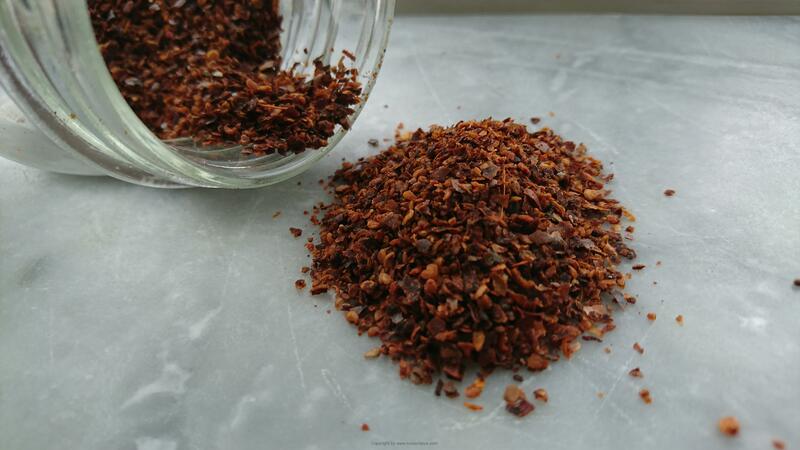 A spice you must know is Pul biber, those special Turkish chili pepper flakes, that do not really look like chili peppers, but are oiled and flat little flakes. They have a mild but aromatic flavor that slowly gives a little strength. The flakes are always on the table in different restaurants and is common to sprinkle on for your convenience. So when I write “chili” in my recipes, it’s always those I’m referring to. They are simply used for ANYTHING – from either the butter sauce to manti, soups, salads, etc. Urfa biber also belong to the slightly more special pepper / chili types. Urfa biber are also often called Isot bibersi and are a special type of chili, that varies from red to almost black and purple. 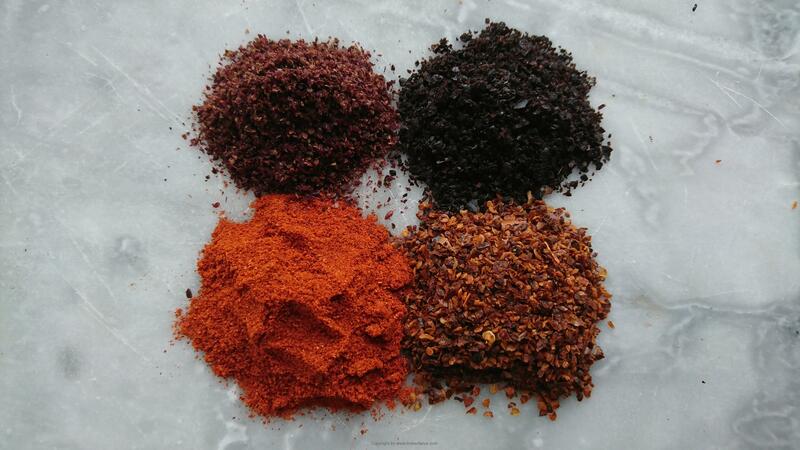 Isot pepper is dried in a special way to keep the dark color and full taste and strength. It is also not a very strong chili but with a kick and really a lot of aroma. It tastes almost bitter like coffee and chocolate, but with a touch of smoked flavor. I always use Isot / Urfa biber in eg Adana kebab, but also for tomato sauce, grilled vegetables and other types of meat. Mint – Kuru Nane is also something that is used in Turkish cuisine. I had some resistance to it at first, but now it’s almost indispensable. It does taste well in ex cacik, but is also indispensable in, for example, the slightly spicy ezogelin soup, in Dolma or with the beautiful Turkish ravioli Manti. 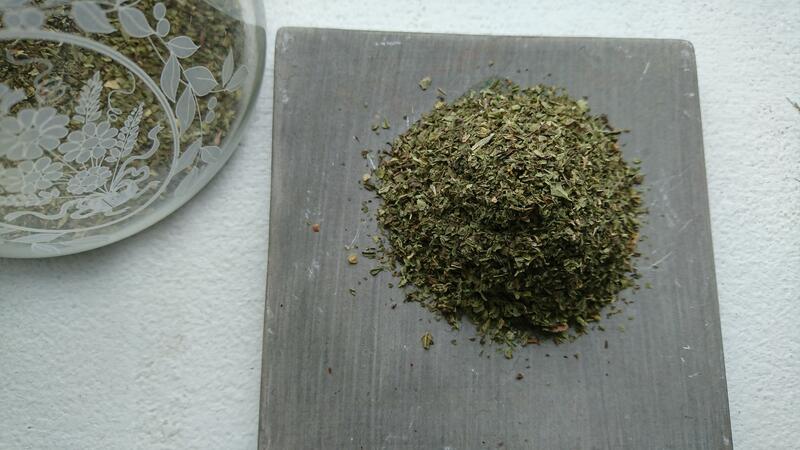 A spice you will use a lot, if you like it or not, is the cumin, kimyon as it is called in Turkish. It is not possible to avoid in chickpeas salad and in several meat mixtures for different kinds of köfte such as Tekirdag Köftesi or the usual Turkish meatballs. One of the more uncommon spices, that I really NEVER had encountered before, was the lemon-like Sumak. 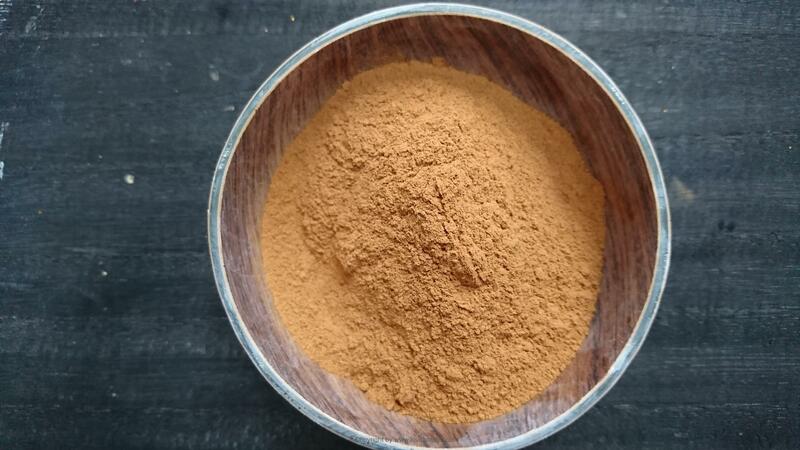 It is a delicious, delicious, spicy and tasty flavor for fish, chicken, in salads etc. Ex. I often combine it with onions and parsley (for kebabs) or for this phenomenal chicken. In the link you can also read a little more about what Sumak is for a size. For example, you may not know, that the spice come from berries on a bush! It can be hard to imagine that sweet, delicious spices comes from a tree. But that’s how it is with cinnamon (Tarcin), which comes from the bark of a particular tree. Therefore, you can get both cinnamon sticks, which are actually like bark and in common powder form. It is used especially in the sweet Turkish cuisine, like home, in desserts and cakes, but also in hot drinks. Cinnamon can be many things and it’s about grabbing the real cinnamon that is full of flavors. You can read more about finding the good cinnamon here. Something as common as paprika is also found in Turkish cuisine. However, I always think that it was a little more exotic here because – especially people in the villages often make their paprika themselves. This happens by placing the mature peppers on the roof terrace for sun-drying, after which they are grinded, when the fruits are 100% dry. Very simple right? And it simply smells phenomenal. In Turkey, however, you have a strong and sweet variant of paprika, which you use a little differently. Finally, there are Nigella seeds, as many know and yet not. Nigella seeds is seed from a plant in the ranunkel family and is also known as “Virgo in the Green”, blackberry and onion seeds. In Turkish they are called corek otu. As you may already know, it is small, hard black seeds, which are used especially to sprinkle on different pastries, bread or cakes. I have also used them on top of these börek. Finally, there are “yenibahar“, “5spices“, “7spices“, “köftebahar” etc. All are different mixtures for different purposes. And perhaps, in fact, most for the tourists. I do not have the big experiences with them and basically, I never buy mixes. I still have most spices at home and would like to mix myself. Then I know what’s in them. My father-in-law is also quite impressed with my spice drawer in the kitchen, which in his eyes is too overwhelming and completely redundant. He often looks at it, when he is home and shakes his head. So that says something about the use of spices in turkish cuisine.